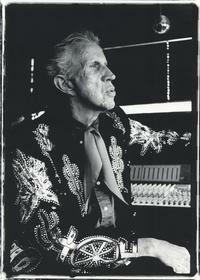 LOS ANGELES, CA--(Marketwire - May 31, 2007) - Country Music Hall of Famer PORTER WAGONER "becomes the 'Master' once again" on his new disc "WAGONMASTER" (out June 5 on Anti-), proclaims the June issue of Performing Songwriter. It's a sentiment that is being echoed at every turn, as the 79-year-old WAGONER returns to his country roots without missing a beat, after a career detour into gospel music and a near-fatal abdominal aneurism last year. Hardly a concession to mortality, "WAGONMASTER" is "no weary farewell," reads a 4-star review in the June issue of Paste. "Wagoner sounds vital and confident, whether tackling hard honky-tonk ('Be a Little Quieter') or delivering one of his trademark sentimental recitations ('Albert Erving'); even the cover of [Johnny] Cash's bleak mental-ward tale 'Committed to Parkview' brims with youthful vigor." Amazon.com marvels at "the miracle of Porter Wagoner's new album," heralding "WAGONMASTER" as "a riveting collection of Southern Gothic numbers," while the May issue of Harp welcomes PORTER back "to the gentlemanly country fold with the lean, mean, rich sounds of yore." In the UK, the May Observer Music Monthly's 4-star review says, "A prolonged gospel kick hasn't messed up his honky-tonk feng shui. 'Wagonmaster' plugs directly into the organic weirdness that lies at the heart of all great country music, covering everything from sonorous recitations about oddball barbers to 'hot wired' women to the boiling depths of Satan's River with equal conviction. Magnificent, mawkish, occasionally plain mad, it emphasizes Wagoner's thoroughbred pedigree throughout." The Observer later concludes that "an eccentric, heartfelt, often brilliant album from a country music giant is reason enough to celebrate." North of the border, the Montreal Gazette hails "Wagonmaster's" "timeless, classic arrangements" in its 4 1/2 star review. "The pompadour still rises high, he's still decked out in a Nudie suit, he's about to turn 80 and Porter Wagoner has made one of the finest country records of recent years." PORTER -- who recently celebrated his 50th anniversary as a member of the Grand Ole Opry at a star-studded Opry event hosted by "Wagonmaster" producer Marty Stuart -- remains every bit as mesmerizing on stage. Describing that event, CMT.com's Hazel Smith enthused, "Those of you who missed the celebration of Porter Wagoner's 50th anniversary as a member of the Grand Ole Opry missed one of the best performances I've ever witnessed."